In larger organizations, GIS and IT staff are often focused on implementing and supporting enterprise applications. This reality leaves many department managers, who see the benefit of GIS, on the outside looking in. Easy to use, cost effective, hosted mobile application sites, support GPS data capture and provide the basic framework for data capture. 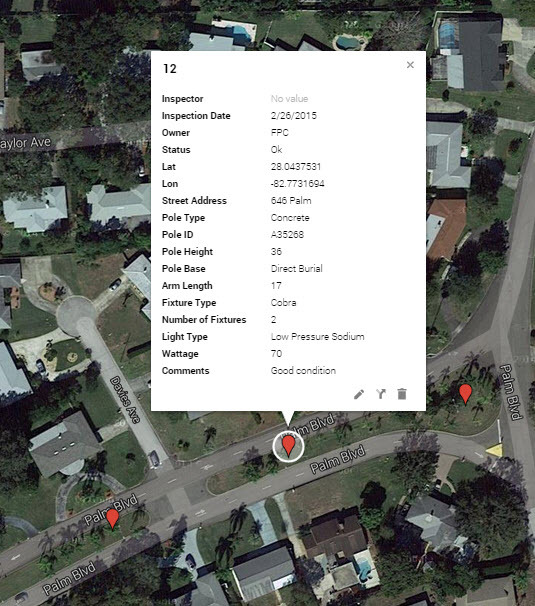 Google’s My Maps, a free Google service, now provides the basic GIS functionality that allows users to view observations on a map, edit locations, edit data and even theme data by fields. The rapid expansion of low cost, cloud based, mobile application deployment sites now allows every department within a local government to deploy mobile applications to field staff for as little as $15/user/month. In the mid to long term, I believe that these hosted solutions, much like the Salesforce.com CRM, will become accepted standard sonce the fear of cloud based solutions is overcome. The result will be dramatically lower implementation and deployment costs for mobile applications. Why Map Your Mobile Data? By being able to capture information on a mobile device and then visualize it on a map, users gain valuable insights on key issues. But what do you do when you can’t get the attention of your GIS team? Interestingly, My Google Maps (released in Sept 2014) is a free service that offers much of the required functionality. GIS professional’s are faced with resolving the cost versus the benefit of survey level accuracy. Some insist that all assets be located at the highest possible precision. Others take the postion that precision is application dependent. For example, if you direct field workers to within 20′ of a street light, they will find it. 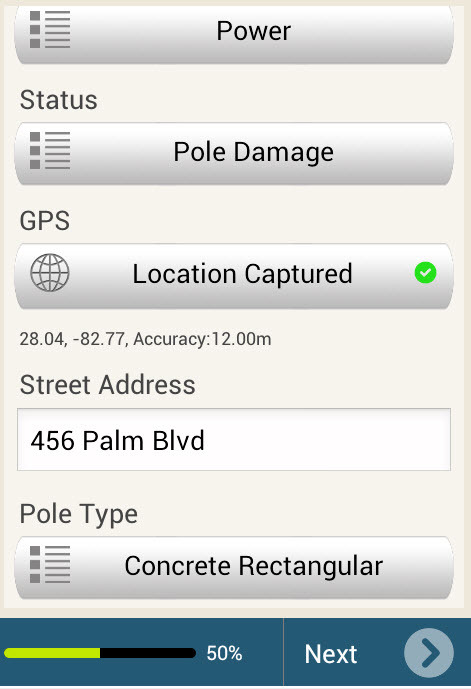 In these types of applications, the GPS precision of smart phones and tablets (6 meters or 20 feet) is often sufficient. It is even more practical if users can then adjust the location as part of a quality assurance program. 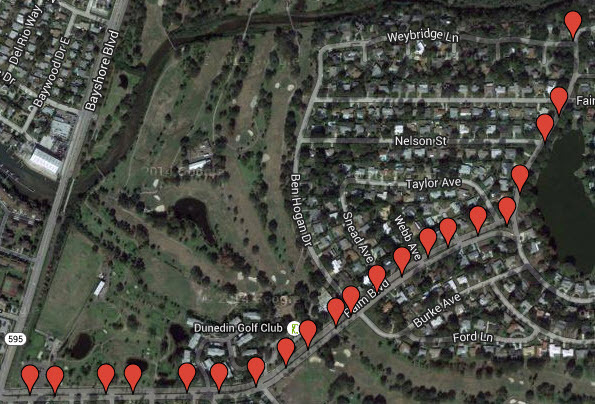 To test this hypothises, we ran a test of a street light inventory application. The goal was to use a hosted web service to develop a street light inventory application and to then load the data into Google My Maps. An example of the application smart phone screen is shown here. Note that the accuracy achieved by the GPS was 12 m (40 ft). Output from the hosted service was a PDF file containing the defined fields, an embedded Google map and user captured pictures. An example of this can be seen here. 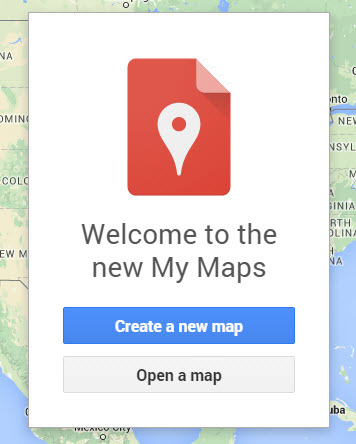 Step 1 – Log into My Maps. Note, you must have a free Google account to sign in. 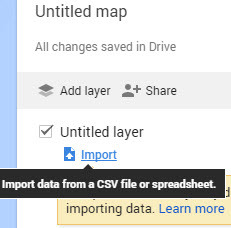 Step 4 – Browse to and select a CSV file that has the data to be loaded. Note: The file must contain latitude and longitude fields. You can then select an individual marker to view and edit both the captured data and the location of the light. Work arounds are available for all of the above limitations but require more careful planning of the workflows used. The emergence of easy to use, low cost, hosted mobile application development sites, integrated with the recently released Google’s My Maps, permits individual departments to configure, test and evaluate location based solutions without the direct support of the GIS department. Once developed, and deployed, the collected data can be easily integrated with an existing GIS for detailed analysis purposes. Start-up costs are as low as $15/user/month plus an investment of 2 to 3 days to learn and build out an application for mobile devices – even less if you can find a free, pre-built application. A 5 crew field work force can be fully operational for $75 to $125 per month for the mobile application service. Service plans, if you need real time access to the data, will add to the monthly cost. A professional engineer and solution architect with direct experience in a wide range of industries including GIS, water, sewer, power, transportation and oil and gas. Currently focused on delivering software for the civil engineers, surveyors, utilities, local governments and their supporting organizations. This is an interesting approach. Feasible and flexible! Wondering How Much You Can Save With BricsCAD? What Will You Do When Autodesk Abandons DWG?